“There was a man who had two sons. The younger one said to his father, ‘Father, give me my share of the estate.’ So he divided his property between them. “Not long after that, the younger son got together all he had, set off for a distant country and there squandered his wealth in wild living. This story contains the core of what confession is all about: reconciliation with God Our Heavenly Father. Notice how the younger son thinks – he is not going home out of any splendid notion of the harm he has done. He is concerned for his own welfare simply. 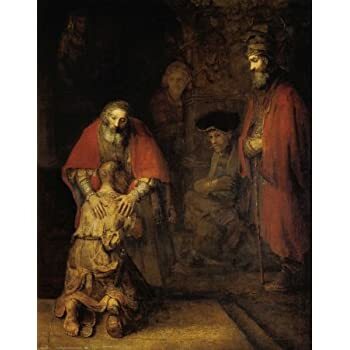 Nonetheless, when he returns home He is greeted by his Father who has been on the lookout for him with forgiveness, with the ring, the robe, the fatted calf, and the celebration. Only then does true repentance come to the young man. God our Heavenly Father is waiting like that for each one of us, looking out and longing for our return. One of my earliest memories is of my mother going to confession. I don't recall much else about it, but it is there, embedded in my conscious and unconscious memory, well-stored, the fact that adults go to confession. I knew this before I knew that children did also. In a few weeks your children will make their first confession, and I invite you to use this as an opportunity to go yourselves. If you go regularly, find time to go at the same time as your children. If it's been a while, take this opportunity to return to the sacraments. Give the Lord your wounded heart. A good confession is a glad return to the right way! So a few questions we should all address from time to time: why do we go to confession? What are the parts of the sacrament? How do we go to confession? How often should we go to confession? What are the effects of the sacrament? So, why do we go to confession? Because we sin, and our sins weigh us down, depress and sadden us, and get in the way of a healthy relationship with ourselves, our fellows, and Almighty God. Chiefly it is the last, that by our sins we offend God our Heavenly Father, as it were nail Jesus freshly to the cross, and grieve the Holy Spirit whose temples we became at baptism. But the other things hold true as well, and are the reason why sin 'offends God'. He has made us for happiness, for communion with each other and Him and when we sin we break and spoil some part of the fellowship of love we were made for. Confession of our sins is part of the process that heals, enlightens and strengthens us in our relationship with Almighty God. So why confess our sins to a priest? Many other types of Christian will ask along the lines of 'surely if you confess your sins directly to God, He will forgive you?' Now this is in a certain way true: that is, if you were able to achieve something called 'perfect contrition' then there would be no need to go to confession. Perfect contrition is a deep sorrow for our sins which arises purely out of sorrow for having offended God and our neighbour without concern for our own personal discomfort at being out of sorts, and without reference to fear of Hell. However even if we could achieve perfect contrition we should wish to go to confession as a sign of repairing the damage done to the community of the Church by our sin, and in order to receive the counsel of the priest to whom we confess. Confession to another human being also imposes a clarity of thought and a level of felt accountability that is not necessarily present in personal prayer. Furthermore, except perhaps for done very rare saints, it is impossible to know that one has achieved perfect contrition, and the sacrament of confession, by the power of the Holy Spirit, turns the somewhat flawed sorrow (technically called 'attrition' ) which is all most of us can achieve into perfect contrition through the grace of the sacrament. The priest in this context is acting 'in persona Christi', and has been given, through the grace of ordination, the power to forgive sins in the name of Christ and his church. What are the parts of the sacrament? The parts of the sacrament of confession, what makes it valid as a sacrament are a firm purpose of amendment, confession of sins to a priest, the act of contrition, absolution, and penance. A firm purpose of amendment is the determination of the will, at the time of confession, that you intend not to commit these particular sins again. Hence one should make a good examination of conscience – to see ‘what’ one is determining to avoid, and then resolve inwardly to avoid those things. Confession of sin: having prayed to the Holy Spirit for grace, one should enter the confessional, or approach the priest and make confession. First of all one should tell the priest any important relevant fact about one’s state of life – whether one is single, married, parent, if one is a priest or religious, for example. More rarely one should mention that one is involved in a particular profession. For example it is relevant to confession of a habit of drunkenness if one is a long-haul lorry driver or aeroplane pilot! What should one confess? I append to this talk an example of an examination of conscience, but this is somewhat according to the time and type of confession one is making. There are many such examinations of conscience to be found online. Find one which you find helpful. How does one go to confession? After making the examination of conscience, one enters the confessional, or approaches the priest, one says ‘Bless me Father for I have sinned, its x (amount of time) since my last confession’, and then confesses the sins that have intervened. Grave sins should be confessed in detail. After some advice the priest will ask you to make an act of contrition then gives a penance, and absolution. One then does the penance. Confessions are of several types, and I will come back to this, but a good rule of thumb is to be as honest as possible about the actual sins, and to avoid making excuses, but at the same time to include any relevant fact that makes the situation clearer. It is important to confess all serious sins, and it is wise to also confess – in a more general way – what are called venial sins. So it is fine to say in a general way ‘I eat too much’ or ‘I have told lies’, but if some circumstance makes a particular sin worse - the lies you told destroyed another person’s character in a materially damaging way for example – this should also be mentioned. Generally the priest will give some advice. Very often, especially if he is a good man and sometimes even if he is not, this advice will be very useful for living the spiritual life. The Holy Spirit is present at every stage of a good confession, and will guide the priest, if he is open, to say what you need to hear. So listen carefully to what he says. He will also give a penance, of which more later. A few remarks: This ‘act’ is playing out in words what your attitude to sin should be: You should be sorry for it, that is, because it offends against the goodness of God, and you should ‘will’ - that is ‘intend’ not to do it again. This intention is doomed to failure unless assisted by God’s help – what we call ‘supernatural grace, which is basically God’s work within us, and our being made able to live with God’s own life. If you go often to confession it is easy to be distracted at this point, but this is the moment when you are restored to baptismal innocence, freed from your sins, restored to the glory and dignity of being a child of God. To notice: the sacrament is conferred by each person of the Holy Trinity. The primary mission of Christ is given by His Father, and it is contained in this sacrament: The forgiveness of sin. In turn, through the Son, God the Father sends His Holy Spirit for the same purpose. And the result? ‘pardon and peace’! The word ‘absolve’ means ‘to set free’, so when the priest says ‘I absolve you’ (which he does not as himself, but in the place of Christ), you are being set free. What is not to like? Penance: Finally, having thanked the priest (it is not obligatory, but we are in England, after all) you emerge from the confessional, free of your sins, at the beginning of a new lease of life. It is a time of joy. The prodigal Father in the story I just read to you welcomes the son with a robe, a ring, the fatted calf, a party. Our Lord in the Gospel of Luke says ‘there will be more joy in heaven over one sinner who repents than over 99 righteous ones who have no need of repentance.” (Luke 15.7) You just caused a party in heaven! There is still the penance to do. Sometimes when one’s life is in order the trade-off cannot seem too absurd, though really one should always marvel: This my sin is what nailed Jesus to the Cross, and the priest just said ‘say three hail Marys’. How does that work? The best explanation of this was given to me by a man who was a convert to the Church, who said this came to his mind when he experienced confession for the first time as an adult. He said –‘I confessed the sins of my whole life, and the priest said ‘three hail Marys.’ Like the unjust steward he was saying, take your bill and write thirty.’ As Christians in general our attitude to forgiving others should be like that of the unjust steward, but in a particular way the priest acts like the unjust steward, writing off for us the debt we could never ever pay. I said earlier that there are different types of confession. Sometimes it is enough to follow the advice that use to be given in a previous generation – be blunt, be brief and be gone. In the end our sins are not interesting, even to us. To linger over them unnecessarily can be self-iindulgence, especially if one is going at a ‘peak time’ like Christmas, and holding up a queue forty persons long. This really applies to frequent confessions – I found, going regularly to the same confessor that the confession first got very long, but finally very short, not because I was sinning particularly much less, but because all the main explanations had been made – there was a limit to the number of times my appalling relationship with x, y, or z could b adduced as an excuse, and the priest had heard it all before. The second type of confession is when a person has not been since 1990, or thereabouts- or not since their first confession, or never. It is reasonable to take some time over such a confession. If any of you are in that category, or even ‘it’s been a couple of years’, be of good courage! If you want to make a priest happy, making this sort of confession is a wonderful way to do so, not to mention the parties in heaven. The third type lies somewhere between these extremes. It is a sensible thing, after one has confessed the general sins generally, and the serious sins particularly (deliberately omitting a serious sin causes the confession to be wholly ineffective) to focus on particular areas of difficulty, and go into detail over these. This is the best way to get a focussed word of advice from the priest. How often should one use the sacrament? I remember hearing about a socialite who decided the coolest religion was ‘lapsed Catholic’ and wanted to know how you became one of those. Actually it is not that hard: You simply do not go to confession once a year, or to communion during the period from Ash Wednesday to Pentecost! According to the Church's command, "after having attained the age of discretion, each of the faithful is bound by an obligation faithfully to confess serious sins at least once a year." (CCC1457). However a healthy practice of confession more regularly than this is essential for spiritual growth. More than once a week is probably too often. Less often than once every three months is too little. When you are under stress, in grief or temptation a more frequent use of the sacrament will help you a great deal. When things are going smoothly going slightly less often may be a permissable, within the parameters just laid down. Confession: This is a basic human need, not a peculiar Catholic thing – as is shown by the upsurge of confessional t.v. shows – but the difference between confessing to Jeremy Kyle o Oprah Winfrey on television is two-fold – the public humiliation aspect is absent – the priest hiself will speedily forget, and no-one else will ever know; but the other, huge difference is that the priest can absolve you – you really can ‘get rid of your old sins’ and start fresh. Penance: as well as everything I have said above, the penance has a reparative aspect, sometimes mirrored in the particular penance. You are making good – or, in the case I think of many priests, they are making good for you – they do penance on your behalf!